With flooded rivers and creeks in the south we headed for Granite Tor, instead of the Eastern Arthur Range A short first day, with a few showers, brought us to Lake Rodway and the Scott Kilvert Hut, where we intended staying the night. With plenty of afternoon left I wandered over to Little Lake Valley and discovered an appealing camp site set amongst snow gums. More than ever I regretted the idea of the hut but, with thoughts of stopping here some other time, continued to explore the edges of the valley. Arriving back at the now crowded hut persuaded me to move to that more congenial spot. Clive and Lyn felt the same urge and the three of us spent a comfortable night well protected from the wind. Sunny breaks in the morning and a sheltered climb did not prepare us for the shock of the wind and cloud rushing over the cirque. Debate took place on the best option, with the majority favouring stopping in Waterfall Valley. This certainly was not my choice and, when the conditions out in the open proved to be better than expected, I was delighted that we could continue on the planned route along the Barn Cirque to Mt.Inglis. A short sharp climb was involved in reaching the yellow daisy decked summit. From there an easy walking ridge lead to a lovely campsite ringed by pencil pines. They were part of a quite extensive forest stretching half a kilometre wide by one kilometre long and I couldn’t wait to explore it. Although a fire had spread its destructive fingers into the forest, most of it was unburnt and in one of the burnt areas small pines between 0.5 and 2 metres were growing healthily. Within the depths of the pine thickets I spotted a few quite small specimens, but could not find any really baby ones. I always had the impression that pencil pines were being defeated, but here at least they looked to be winning a bit back. Originally our decision was to take the tents to or close to Granite Tor, but the consensus was now to attempt it as a day walk. After a beautiful snow gum ridge extensively carpeted with Boronia and not unreasonable button grass plains, Dave Hs predicted the summiting time as 12:30. Thick bands of scrub ahead ensured that this became unachievable and if it wasn’t for picking up an old pad we would have been later than our 3 pm arrival time. The summit was marked by two or three unremarkable granite rocks, just a shade higher than the sea of scrub. During the short spell on the top I thoroughly enjoyed digging into the scroggin; jelly beans were especially tasty. Sue had mixed it for me and along with homemade jam provided a link back to her, that was most comforting. In an endeavour to save time it was decided to descend off Granite Tor in a more direct route, even though this meant a long steep drop into a creek and back up the other side. One advantage was that scrub was replaced by rainforest. The plains were reached some time after 6:30 pm and I suggested a route to avoid a scrubby hill but, although it was good most of the way, it ended in a thick belt of tall Melaleuca. Our gum ridge was reached in the dying daylight and as darkness descended progress became a bit slower, until finally torches were needed. A tired party was relieved when the group of pines sheltering the tents came up out of the darkness; it was 10:15 and the outward journey took 71/4 hours with the return 63/4 hours. A late morning (10 am) start was agreed upon and it was about 3 pm when we arrived at a saddle on the ridge leading to Barn Bluff. With weather fine and warm we decided to set up camp and climb the Bluff. 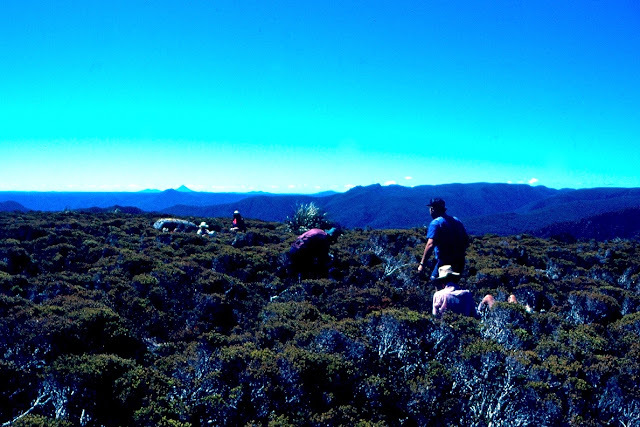 In retrospect I regret not having passed the early part of the morning exploring the plateau below our Mt.Inglis camp. Next morning a scrubby descent tore Dave Hs’ new trousers and led us to Lake Will. Clive and I sat beside the lake under some pencil pines whilst the others headed for a beach and a swim. I gather Lyn’s washing technique caused some amusement. From Lake Will the plains were crossed to lunch beside the lovely Lake Windermere and the afternoon spent reaching a camp site on the edge of Pine Forest Moor. I used the free time exploring the magnificent forest of tall pencil and King Billy pines. The forest started with smallish pencil pines, quickly graduated to very large trees and beyond the King Billies started. Among the huge trees stood one pencil pine of enormous proportions; five of it’s six trunks the size of ordinary trees and it must have stretched some 3 metres in width at the base. Dave Hs and I left in the morning mist for Mt.Proteus whilst the remainder climbed Pelion West. Only low scrub was met and it was only some sections of button grass that dogged us. Mt.Proteus is a most unpretentious mountain (hardly warrants a name) but in contrast the views from the top are good and present a different perspective to the surrounding mountains. We lunched by a waterfall, on the way back, and were astounded to see an airforce Hercules appear just above our heads. On reaching the tents Dave and I had a relaxing afternoon (once we discovered a spot to avoid the marsh flies), with the others returning about 4 pm, after some confusion arising from not knowing if David Hy and Storm had already descended the mountain. Our last day involved walking to overland track to Dove Lake. Dave Hs and myself ascended and looked about Mt.Campbell, Clive peaked Cradle Mt., Little Horn and Mt.Campbell, Robyn, Lyn and John went for Cradle whilst David Hy, Gail and Storm opted for an early return via the Ballroom Forest.